C-TEC's 16-128 line system utilises the same Type A and Type B outstations as our Compact system. The larger system's control equipment comprises one CCU-16 16 line Master Control Unit and up to seven 16 line Expansion Units. 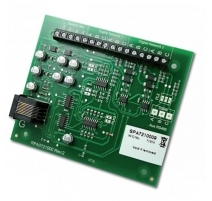 A separate ECU Desk Controller is also required to allow operators to communicate with the system's outstations. Information on these products will appear here shortly. In the meantime download our SigTEL 16-128 Line System datasheet for a brief overview.